IDEX is now officially – in name and brand, in all ways – Thousand Currents! Thousand Currents’ strategies remain the same and our commitment to partners in the Global South is as strong as ever. Thousand Currents is grateful for your support during the rebranding process over the past year. The organization embarked on this change to align the brand more closely with its work. While International Development Exchange – IDEX served us well over the last 30 years, we wanted a name that reflected who we are as an organization focused on exchanging grassroots brilliance. We are all part of a moving, interdependent global picture. For us, Thousand Currents is a powerful concept from the natural world. “Currents,” like grassroots leaders and locally-led solutions, have force and direction. “Thousand” includes you, our colleagues and friends. It also reflects the potential in the multitude when small, yet formidable pockets of people power come together. so it expands, and so can we." 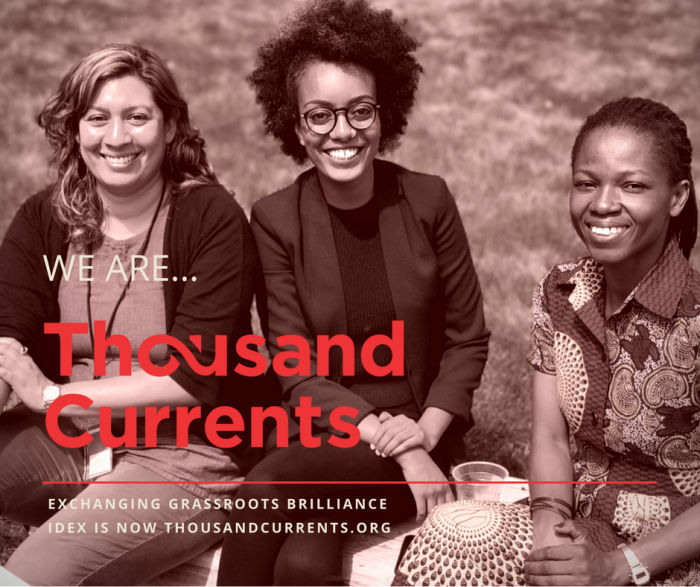 Now officially as Thousand Currents, our brand honors the transformational changes in food sovereignty, alternative economies, and climate justice that are upon us – led by women, youth, and Indigenous Peoples in the Global South! This is an exciting time for us and we hope you join Thousand Currents today in celebration! If you follow IDEX on our existing social media accounts, you will already be following Thousand Currents! Stay tuned for new LinkedIn, YouTube, and Instagram to come! We’ve grown! What does it mean for soon-to-be Thousand Currents?